The Company: Our motto in the studio…where ART meets Stationery, that unique blend of designing “one of a kind” custom hand painted wedding invitations. The designers at EIGHT21 Studios offer the PERFECT alternative solution to the catalog designs of the past. We specialize in custom, hand painted invitations that NO ONE else will have. A blank canvas waiting for a colorful vision from our client’s dreams, mixed with our artistic visions, being truly custom. We are located in the northern burbs of Chicago and service many clients throughout the United States and International as well. Most of our consultation process can be done via emails, slideshows, and/or phone calls…if you are in the Chi-town area…great! We can meet for a personal chat about the event you have been dreaming about. 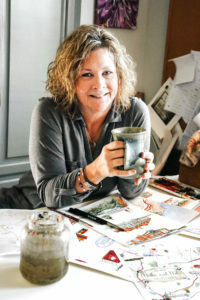 ME: Carol Massa, Full of color and life, an artist in the stationery world! Old school trained, that loves watercolor and acrylics, definitely a RIGHT brainer. A designer of custom hand painted wedding invitations living in the Chicago area, working day in and day out with clients on their custom suites since 2009. Accomplished and published in the wedding market for hand-made, custom hand painted wedding invitations and custom watercolor maps. Still us! …where ART meets STATIONERY. A little behind the EIGHT21 Studios name, the sister company was started in 2012, after my dad passed away suddenly on August 21st…he would always tell me to paint, use your talent and he was a great encourager with a creative heart himself. I began to paint more on canvases then, using my second-hand easel that we purchased on Craigslist. Experimenting and getting back into the “ART” side of things. Painting “old-school” I grab for the brush, or pen first and then tackle the computer side later. The hashtag…It became a “joke” in a way when we would talk about things and hashtag it #821, seeing all the changes that would take place within our family during this time and how my dad was still working things out even after his death. The kids all laugh that Papa has his own hashtag (#821) (#eight21studios). At the end of 2015, we found ourselves in a rebranding mode for varies reasons, Carol Woldhuis Designs has now combined and has become EIGHT21 Studios starting the beginning of 2016, still the same ART, just a new name, sort of! The hashtag #821 can often be found in the artwork as a sort of “Where’s Waldo” kinda thing. Our wedding guest maps always have this hidden inside some type of art like boat registration numbers, plane model number and even on a rowing team from Georgia. Just a little fun fact, about our company name, hashtag, and our dad. During the design process, we do more than design your invitations…we build a relationship while turning Stationery into ART. We take pride in our work and quality of our designs. We use professional printers and top of the line luxury papers. Our background papers are our designs (no stock images or clip art are used here ), we create the designs to collaborate with our notes and invite suites. We hope you enjoy them too! So let’s get started creating and designing your dream invitations!